We are looking for a sassy blonde female drummer, 50 years old plus, who's full of attitude and energy, who'd fit in to an exciting new band. You'd be required for filming for the music video next week. 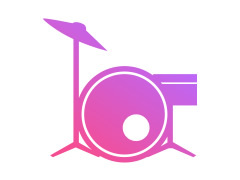 This is an exciting opportunity for the right drummer to work with an established song writer. This will lead to live gigging both in the UK and America eventually. Expenses : Travel expenses. Food supplied. Filming in Crowthorne, Berkshire. Live gig experience and a zest for life!